Do you really need a recipe to make curry? In my opinion, no. But then most recipes are only guidelines! 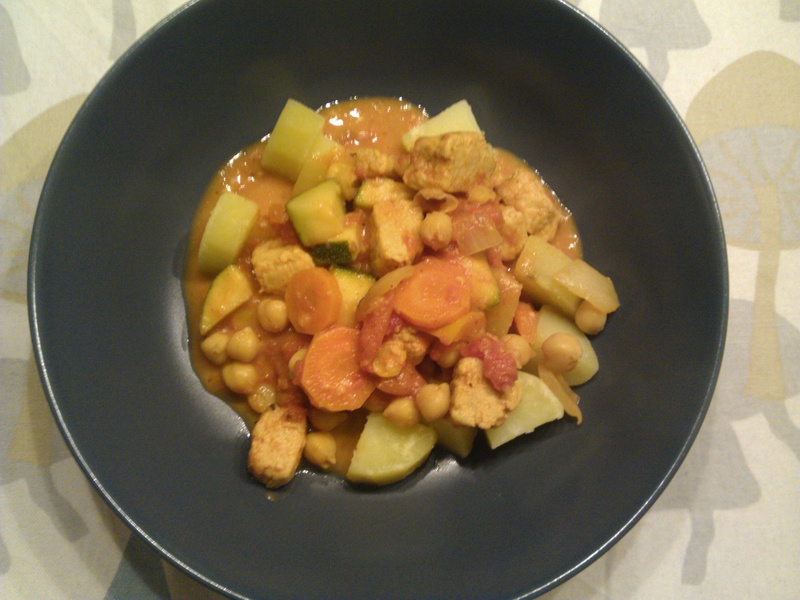 This is what our curry turned out to be this time, but it might be different next time. Bring a pot of salted water to a boil. Add the bay leaf and chickpeas, bring to a simmer and cook for 1,5h, or until chickpeas are tender. Drain and keep chickpeas aside. Heat oil in a big pot. Cook onion & garlic until golden, then add carrot and cook until they start to turn a lighter shade. Add the bell pepper & courgette and cook for a few minutes, letting them turn slightly golden. Add the curry powder and cook, stirring, for a minute. Add the chickpeas, quorn, and tomato pieces. Add 1 dl water (approx, just enough to get the liquid to barely cover everything). Bring to a summer and cook for 10-15 minutes. Add the coconut milk and stir through. Cook for a minute or so. Serve with potatoes (as on the picture) or rice.